‘Tis the season for setting goals and making resolutions. Before you sit down to set your sales goals for 2016, take a minute to examine which goals you’re setting for your team. In the rush to close the sales year and set the next year’s quota, it may be that your organization is concentrating on the numbers, rather than taking the time to create a solid plan that will help your sales reps to attain that goal. Now is the time to sit down, examine your sales process and put a plan in place that will help your team be successful in 2016. The key to setting annual sales goals is understanding the many actions that need to happen to drive the desired result. “The first thing to do is sit down and consider how you’re going to get there,” Jordan said. “Think about who your team members are, and how much of the goal they can bring in 2016. Maybe you know Bob can bring in $3 million, Michelle can get $1.5 million and Phil can get $2.4 million. “The second thing is to think through, individually, how you’re going to help those people get there: What are their individual barriers going to be, what kind of coaching or what kind of direction can you provide so that the individual sales people can get where you need to go,” Jordan said. Your specific action steps are unlikely to be the same for every salesperson on your team. Take the example of two sales reps who must each bring in $2 million. One rep has been in her territory for a long time. One is a new hire. Their paths to that $2 million are going to be very different, according to Jordan. “For someone who’s been in the territory for a while, their goal may be to go to their existing accounts,” he said. The plan for that sales rep may include account planning, which accounts to target for cross-selling products, and how to upsell services. A sales manager would outline a very different plan for the new hire. “If they’re new, those activities won’t look like account planning because they don’t have accounts. Those activities will look more like prospecting,” Jordan said. The new rep’s plan might include how to identify leads, planning cold calls, and research. These plans are not necessarily set in stone. They may even change over the course of the year, as the reps’ skills and accounts change (that’s where sales coaching comes in), but having an initial plan going into the New Year is the could be the difference of sales time that’s spent wisely, or wasted. Often, according to Jordan, sales leaders lack the ability to set their own sales goals for the year. That math (looking at last year’s sales and multiplying that number by a desired growth rate) is done at the corporate level and handed down to them. That doesn’t mean the burden of planning has been removed from the sales manager’s shoulders, however. So what do you do when a sales quota for the next year is dropped on you and your team? Say you want each salesperson on your team to close 80 deals in the coming year. To account for factors like vacation time, holiday breaks and other uncontrollable events, you can safely assume that a salesperson who closes seven deals a month is on track to reach the goal of 80 deals closed by year end. Calculate your sales conversion rate by dividing the number of won deals with the number of initiated deals. If it takes your team 10 contacts to close one sale, your rate is 10%. Calculate how many calls, emails or meetings you need to make your current conversion rate work. If you want each member of your team to close 80 deals in the next year, you need them each to make 800 calls in the next year. That means 70 calls every month, or 16 calls a week. The upshot? You may not be able to force your team to close 80 sales in 2016, but you can keep track of whether or not those team members are making 16 calls a week. There are some things you just can’t plan. Take lead generation, for example. According to Aaron Ross, author of Predictable Revenue, the problem with creating lead generation to support an annual goal, is that many companies make plans and set expectations around results before they’ve even started to generate those leads. His advice? Once again, action. No one likes to think about failure, but don’t skip this step, because it’s vital. Part of planning your annual sales goal isn’t just planning to meet it, it’s also knowing precisely what you’ll do if you don’t meet a quota. 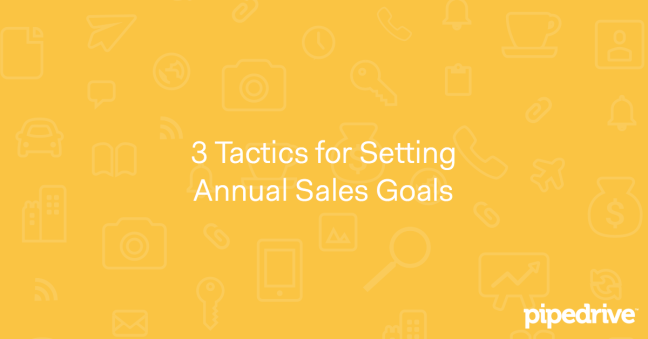 Failing to hit a monthly sales goal once or twice doesn’t mean the annual sales goal has to be abandoned. You will, however, need to know how you’re going to adjust your plan to meet your annual goal. Make a list of all the problems your team could experience, and exactly consider how you’ll handle them before they happen. If your most successful rep quits, how will you adjust goals for your team? If a competitor changes their price, will it impact your strategy? If a team member is not making their calls, or following their action plan, how will you coach them? What do you do when your team is not hitting their targets? What exactly will you do if your team doesn’t make a monthly sales goal? Setbacks are a part of business. Knowing how you’ll handle those problems will take some of stress out of the experience, and may help you be more proactive about identifying potential problems before they happen. Remember, planning for failure is not the same thing as planning to fail. Setting your annual sales goals is about much more than choosing a number, or expecting your reps to meet a quota that’s been set for them. It’s about putting together a roadmap that will get you and your team to the sales goal that’s been set, it’s about understanding your sales process, and making a plan to help your team succeed. Discover the sales performance statistics in our Global Sales Performance Review.